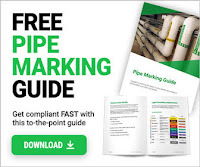 Assuming that methods for avoiding the need for tracing have been considered and rejected, the first step in matching the heat-tracing to the piping system requires an analysis of fundamentals. These include the type of application, suitability and relative cost of different types of heat-tracing, availability of steam and/or electricity, amount of heat loss which must be made up, requirements for temperature control, and classification of the traced area as a hazardous or ordinary environment due to the presence of flammable substances. are listed in the same group. To ensure that the heat-tracing system selected will operate safely in a hazardous environment, it must also be classified according to its NEC temperature identification number, or T rating.49 The NEC specifies that the temperature of the exposed surface of the (electric) equipment not be in excess of 80 percent of the ignition temperature of the combustible atmosphere. The Zone System offers more methods of protection of areas from both equipment failure and excessive temperatures. The T rating system is used, although there are not as many T ratings in the IEC system. The available ones, however, match those of the NEC exactly. The zone system has the possibility of being less expensive to install in some instances, and that is its attraction, especially on a worldwide design basis. By comparing the T rating to the area classification, an assessment can be made as to heater eligibility for a particular piping system. See the later section ‘‘Design Considerations’’ for a further discussion of T ratings and sheath temperature calculations. Environmental factors include whether the area is dry or wet, moderately or severely corrosive or noncorrosive, and whether the tracing will experience rough handling or mechanical abuse during installation, operation, or maintenance. These considerations are primarily related to the performance of electric heat tracers. Electric heaters exposed to any of the environmental stresses listed above must be protected accordingly: A metal sheath of a material is able to withstand the corrosive agent for MI cable; a braided sheath covered by a polymer jacket formulated for protection from particular classes of corrosives is required for polymer-insulated types of heating cables (jacket of modified polyolefin for resistance to moisture and inorganic chemical agents; fluoropolymer for resistance to organic chemicals). The heater must be rated to withstand anticipated maximum exposure temperatures. In addition to selection of a system with the appropriate T rating, environmental protection, and proper installation, a heat-tracing system must be evaluated in terms of the risk and consequence of failure. Savings in front-end costsmay not be justified if the failure of a tracing system incurs the far larger expense of disrupting a process which depends on maintaining an acceptable temperature in the traced piping or requires removal and replacement of the thermal insulation and tracing system. Steam tracing systems have high maintenance costs, but system failure is generally not a concern. The major cause of electric tracing system failure is compromised insulation. Zone heaters and self-regulating heaters have parallel circuits. Failure of a single heating element does not bring down the entire system, and repairs can be made in the field. The series circuitry of MI and polymer-insulated cable allows no such flexibility. A single failure brings the entire system down. MI and polymer insulated cable is difficult to field-repair, requiring the services of a trained technician. See the section ‘‘Types of Heat-Tracing Systems’’ for detailed characteristics of different heat-tracing systems. Table A classifies heat-tracing technologies according to operating temperature ranges and maximum exposure temperature. Note: In practice, an occasional short interruption of power will not be a serious concern in the selection of electric heat-tracing. Heat loss from a fluid-filled pipe is sufficiently slow that intermittent power outages are unlikely to cause a serious lowering of temperature. In process plants, steam is almost universally available. And except in regions with substantially developed hydroelectric power, electricity is invariably generated from steam. When one is considering the use of electric heat-tracing, especially in some developing countries, the reliability of the power for uninterrupted delivery, available voltages, and the consequences of outages must be evaluated. In practice, heat loss from a fluid-filled, insulated pipe is a rather slow process. It will take many times longer than the duration of an intermittent power outage to suffer a serious lowering of temperature. For example, an aboveground NPS 2 (DN 50) in carbon-steel pipe with 1 in (25 mm) of fiber glass insulation containing static water at an initial temperature of 50 F (10 C) will take 21 h to freeze when the ambient temperature is 20 F ( 29 C) (see Table A). Unless power disruption is expected to be of long duration (an exceedingly rare occurrence), reliability of the power supply is not a determining consideration. One exception to this is the tracing of instrument lines. Because of their small size, instrument lines will freeze much more quickly. In the above example a 0.5-in instrument line would freeze solid in 4 h (see Table A). While this is much quicker than a pipe, it is still generally less than the duration of the typical short-term power failure. The most significant factor in a decision between steam and electric tracing is the cost of installing and operating the system, and these costs depend on factors such as the geometry of the piping system, cost of labor and energy, and local tracing practice. In general, installation of steam tracing is more labor-intensive (¹⁄₂-in copper tubing is more difficult to install than the more flexible electric cable). In high-labor-cost areas, such as Europe and North America, the expense of labor can easily offset the higher material cost of electric tracing. In areas where labor costs are considerably lower, steam may have an economic advantage. This is especially true in South America, where steam tracing predominates and the practice is well established. Since most electricity is produced from steam with about a 40 percent conversion efficiency, raw energy cost will always favor steam by a factor of 2 to 3. However, steam tracers have inherent disadvantages that usually make electric tracing more cost-effective in overall energy utilization. Maintenance costs also tend to favor electric tracing. 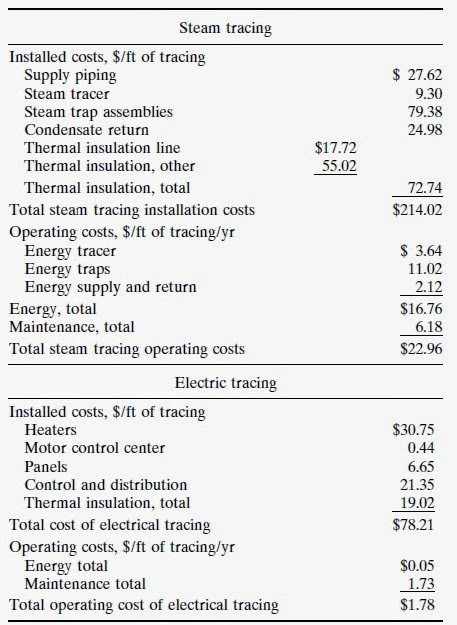 As with installation, the maintenance cost differential between electric and steam tracing will tend to be greatest in high-priced labor markets. The above tradeoffs generally apply to both pipe tracing and the tracing of instrument lines. Because they are smaller, instrument lines require less energy, but this causes only a slight decrease in costs for both steam tracing and electric tracing. One major disadvantage steam tracing has in tracing instrument lines is that care must be taken to ensure that the steam tracer does not overheat the line. It is possible for a steam tracer to actually boil a small instrument line. This is generally not a concern with electric tracing as self-regulating heaters can be used. Computer programs now exist which can greatly simplify the work of determining the economics of steam versus electric heat-tracing. Many heat-tracing vendors provide user-friendly heat-tracing selection programs for use with their lines of products. Input involves supplying answers to a series of fill-in-the-blank questions covering size, diameter, and geometry of the piping to be traced; ambient and maintenance temperatures; control requirements; labor costs; and exchange rates. The program then calculates worst-case heat loss, determines the components needed to build a steam or electric tracing system to maintain the pipe at the required temperature, and calculates the associated material, installation, and operational costs for both cases. 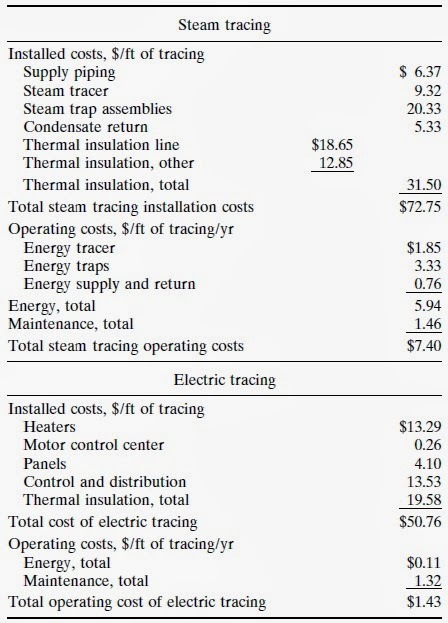 Cost Comparison of Steam and Electric Tracing In a study presented at a September 1990 meeting of the IEEE, a major chemical company compared the installed and operating costs of both steam tracing and electric tracing for a freeze protection system and for a process temperature maintenance system. An existing electric tracing system was used for the freeze protection analysis. The actual costs of installing and operating this system were compared with detailed engineering estimates of the costs of installing and operating a steam tracing system to do the same task. For the process temperature maintenance study, the costs of an existing steam tracing system were compared to detailed engineering estimates of the costs of a similar self-regulating electric tracing system. The results of this study are summarized in Tables B and C, and they demonstrate that the electric tracing system is less costly to install and operate. It is interesting to note that even if the higher energy costs for steam are disregarded, the steam systems still have higher operating costs due to the expensive maintenance required. This suggests that the availability of excess low-pressure steam is not necessarily an adequate justification to select a steam tracing system instead of an electric tracing system.